Twyla Tharp always seemed so New York – frantically quick, unexpected turns of phrase, “distracted from distraction by distraction,” to quote T.S. Eliot. Or so Hollywood, languorously glamorous. So when I heard her 12-year-old Quaker/Shaker work, “Sweet Fields” would come to McCarter, danced by the Aspen/Santa Fe ballet, nothing could keep me away. She had gone back to some Quaker ancestors for her inspiration and used Shaker-like hymns and William Billings for music. I craved the simple lines of a simpler time, the message that faith-filled movement might bring. Had she done it? Had this impatient, wise-cracking choreographer managed, with a straight face, to summon purity, faith, devotion, and simplicity. Yes. I’m not going to try to describe it on the Sunday morning I’m writing this, as I listen to the Anonymous Four sing similar music on NPR and get ready for church, but the answer is yes. Aspen Santa Fe came to McCarter on Tuesday, November 18, bookended by the Soweto Gospel Choir on Monday and followed by Emmanuel Ax and Yefim Bronfman playing two pianos on Wednesday. What a lineup. Re the Soweto – since we moved to Princeton some 25 years ago McCarter has had “diverse” programming. It was here that I first encountered Sweet Honey and the Rock, for instance. Apparently it was not always so. At the memorial service for Fannie Floyd earlier this year, her husband Jim, a former borough mayor, said that Fannie had been instrumental in pointing out to McCarter that Princeton’s African American community were not seeing themselves on stage. Thank you, Fannie. We bought tickets to Ax/Bronfman early in the season because they were playing my very favorite, Brahms Variations on a Theme by Haydn. My request to use the Haydn theme for my wedding march was rejected by the organist, so I hear it every chance I get. It’s been way too long since we’ve seen a recital. When I worked a five day week, if I went out at all, it was to see dance, or maybe a symphony. It boggled my mind, to use a cliché, to watch two old masters put their hearts and souls into the old masters. In addition to the Brahms they played a Mozart Sonata in D (K.448) and Rachmaninoff’s Symphonic Dances (Opus 45) plus a Latin-styled confection, “Recuerdos’ by a living composer, William Bolcomb. To make it even more special, I encountered a third “old master,” Moshe Budmor. (Sorry Moshe, even though we both take Pilates with Anthony to keep us young, we both get senior citizen rates). Moshe is a child at heart; his musical work is play and he loves toys. 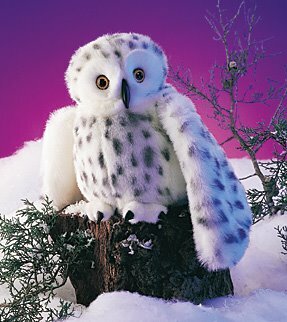 Together we perused the array of puppets at the McCarter shop, and I was ready to buy the fabulous Snowy Owl, with a head that can turn 360 degrees, but Moshe, an even more experienced grandparent than I, advised against it, because the turning mechanism is too difficult for that age. Perhaps I’ll buy it for myself, to remember the moment. (A note to the sponsors of the Bronfman/Ax evening, printed as the Robert J. Ciattos and Mary and Ted Cross and the Aspen Santa Fe evening – Katherine Benesch, Adam Burrows, and Mr. & Mrs. Edward B Matthews. Thank you. ).